Catholic Chapel formerly the Schwenckfeld family chapel. 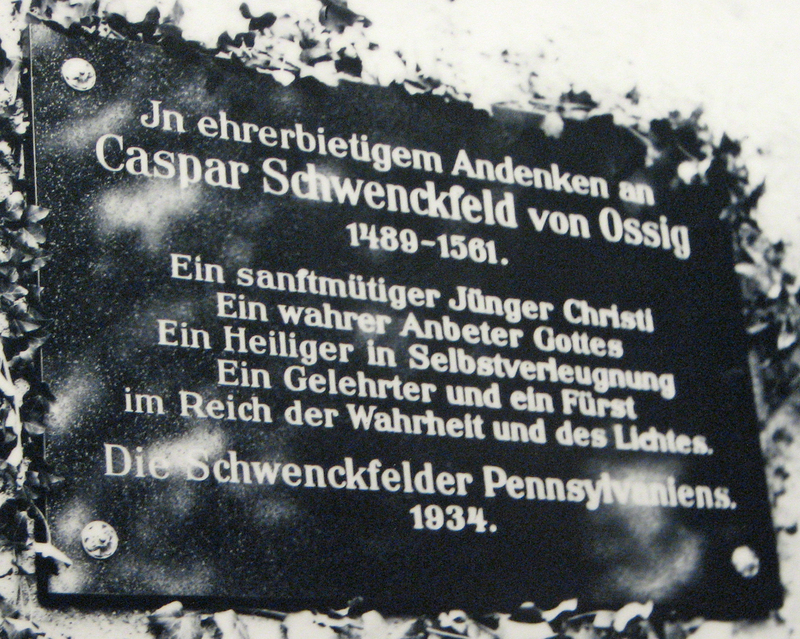 During the 1934 Schwenkfelder Pilgrimage, a memorial tablet in honor of Caspar Schwenckfeld had been placed on the side wall of the Ossig Lutheran Church and was unveiled at a memorial service on July 26, 1934. Unfortunately, when the 1972 Pilgrimage with Dr. Jack Rothenberger visited the church, the tablet was missing, whereabouts unknown. Wroclaw is the capital of Lower Silesia and one of Poland’s oldest cities. 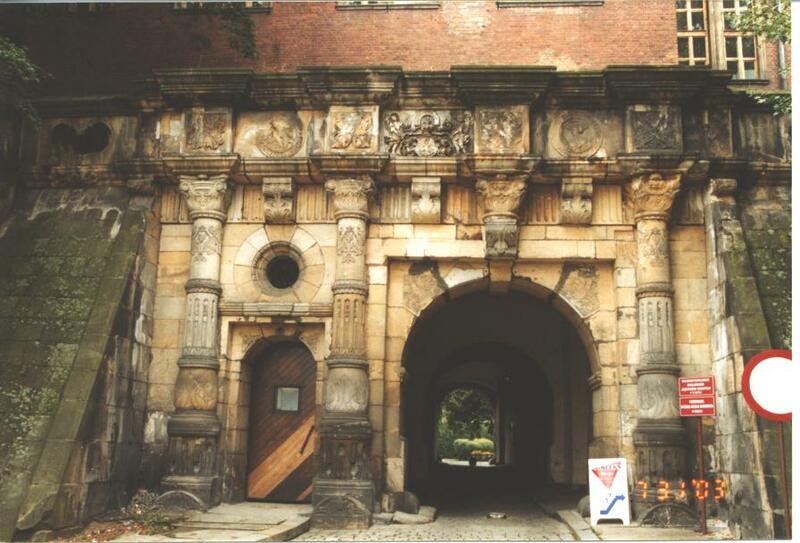 In Schwenckfeld’s time, it was a university city and the center of the Silesian Reformation Movement. In 1510, Caspar Schwenckfeld was asked to serve as chancellor and spirutal advisor to Duke Frederick II of Liegnitz. 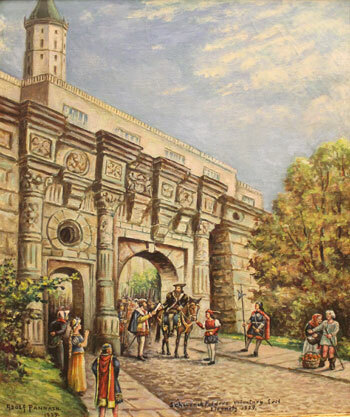 Painting by Adolf Pannash (1929) depicting Caspar Schwenckfeld voluntarily leaving the town of Liegnitz. Courtesy of the Schwenkfelder Library & Heritage Center. Liegnitz Castle where Duke Frederick II lived and where Schwenckfeld was courtier. Schwenckfeld lived many years in the castle of the Freybergs (Oberes Schloss) in Öpfingen. 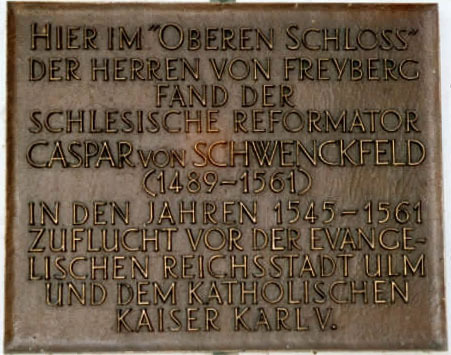 Monies for this plaque installed to the right of the main entrance were collected from the Schwenkfelders in America in the mid-1980s and displayed at a 500th Anniversary of the birth of the reformer Caspar von Schwenckfeld in 1989 by the town of Öpfingen. 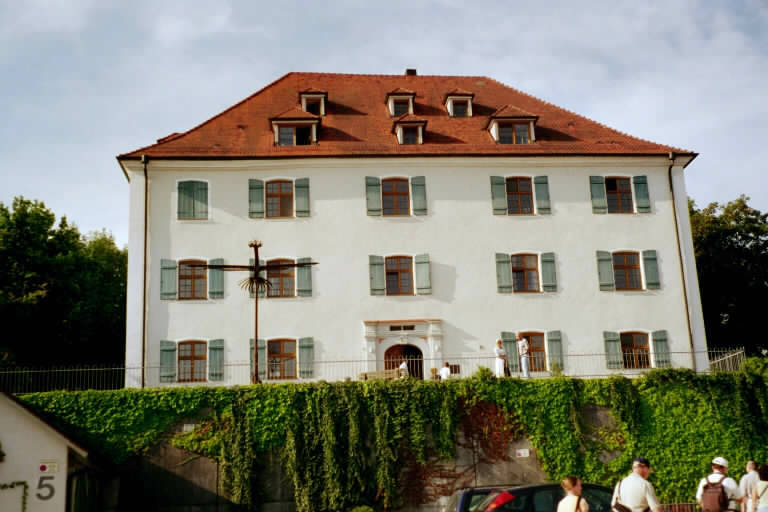 Oberes Schloss (upper castle), Öpfingen, where Schwenckfeld lived a number of years. Plaque commemorating Schwenckfeld now attached to Oberes Schloss. A fugitive for many years, Schwenckfeld found shelter in his last days in the home of Dr. Agatha Streicher where he died. 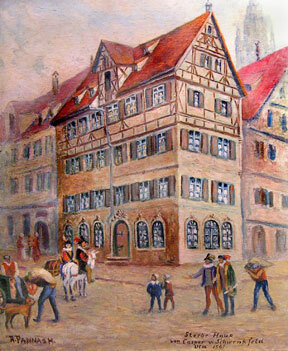 This home was originally located across the street from the Rathaus (city hall), but the house was destroyed for a new street. 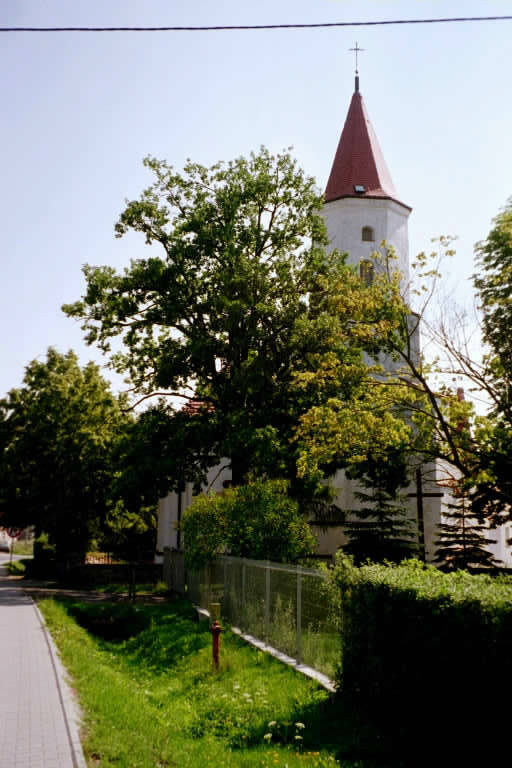 It was originally believed that Schwenckfeld was buried in the cellar of the Streicher house, but it has also been speculated that he is buried in the Freyberg family vault (which is sealed) in Öpfingen. Plague commemorating Schwenckfeld placed in 1989. Caspar von Schwenckfeld, Reformer, born 1489 in Ossig, Silesia. 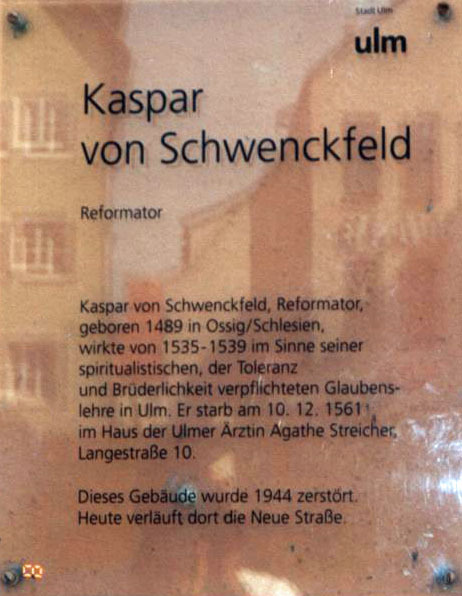 He brought about from 1535-1539 in his spiritual senses, the committed doctrine of Tolerance and Brotherliness in Ulm. He died December 10, 1561 in the house of the woman doctor Agathe Streicher 10 Longstreet. This building was destroyed in 1944. Today New Street runs there.